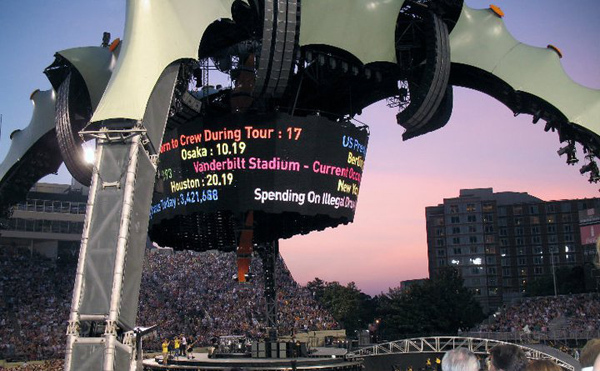 Legendary rock group U2 brought their record-breaking 360° Tour to Vanderbilt Stadium Saturday, July 2, 2011. The concert marked the first time the band played Nashville since 1981, although their Joshua Tree Tour made a stop in Murfreesboro at Middle Tennessee State University’s Murphy Center in 1987. However, that show was overlooked by most local journalists who repeatedly touted the recent Nashville show as U2’s first in the area in 30 years. Unfortunately, I was not in attendance for U2’s 1987 MTSU performance, but lucky enough to witness their December 1987 stop in Atlanta. Although my U2 fandom had been firmly in place since discovering them on MTV in 1983 (a time when the music video channel actually aired music videos), I regrettably didn’t have an opportunity to see them perform live until 1987. My official countdown to U2’s Music City July 2011 concert began in October 2010, when the 40,000 seat stadium sold out in a matter of minutes. I was one of the lucky few able to score a pair of general admission tickets. After nine long months of anticipation, the week leading up to the show began with multiple trips downtown to watch U2’s considerable crew slowly erect the massive stage, nicknamed “The Claw, as well as playing numerous rounds of U2 trivia with my college buddy and fellow U2 enthusiast Jon, as this was going to be his very first U2 concert. The week’s activities also included discussing ultimate set lists, listening to the band’s entire discography in chronological order, and ranking each album, while defending our self-proclaimed expert opinions with impassioned debates. Surviving what seemed like the longest week of my life, the day of the show finally arrived. After awakening at 6 a.m. that Saturday morning, Jon and I headed downtown with our camping chairs, bottles of water and various amenities. We claimed our spot at 10 a.m. in the general admission line, which wrapped around two entire city blocks. We grinned and high-fived each other as we ended up 633 and 634, numbers that had been written on our arms with a green Sharpie marker and we proudly donned as medals of honor. The 97 degree heat might as well have been 197 degrees, given the unusually high humidity and the clear, cloudless summertime sky. The hot sun was relentless and seemed determined not to give us even a moment of relief. Our only reprieve was taking turns crossing the street and standing in the shade under a tree. Around 3 p.m., we had to surrender all of our supplies and wait patiently as we, along with hundreds of other fans were lined up numerically and single-file. By the time we were herded through the tunnel and headed towards the field, it was after 5 p.m. We walked vigorously to claim our spot inside the claw’s inner circle, where we found ourselves dead center in front of the mammoth stage. We were rewarded by having to stand on metal flooring, which covered the football field and absorbed all of the unforgiving sun’s excessive heat. We also found ourselves unable to leave our spot for water or bathroom breaks, as the thousands of envious people behind us were unwilling to let anyone from the inner circle pass through the blockade of sweaty, human flesh that now encompassed the entire football field. For a fleeting moment, our general admission tickets didn’t seem to be as much of a prize as we had originally thought. As the assiduous sun continued to beam down, my mind raced with such thoughts as: Who’s the idiot who started lining up at 6 o’clock this morning when the gates don’t open until 5 p.m.? I’d like to personally flick them on their head for making us all suffer needlessly for hours when all they had to do was cool their heels until show time. But instead of dwelling on such things, I decided to enjoy the moment. After all, I was about to see my seventh U2 concert, and after numerous attempts over the years, I finally made it to the coveted spot in front of the stage. To pass the time in between trading quips with Jon, I started communing with fellow fans, who told various tales of their previous U2 concert experiences. The crowd was made up of all ages, from pre-teens and twenty-somethings, to adults in their forties and beyond. I heard stories of folks who had attended U2’s 1981 Vanderbilt show, as well as attending multiple 360° Tour dates across the country and abroad. There were also a few in attendance who, like my friend Jon, had never seen U2 live and in person. I traded anecdotes with fellow fans who, like myself, had managed over the years to see the band on nearly every tour and witness Paul “Bono” Hewson, Dave “The Edge” Evans, Adam Clayton, and Larry Mullen, Jr. rise slowly from obscurity to ultimately become the world’s most popular rock band. We were also informed of the lady who had camped out the three previous days to secure the first spot in line. The Nashville stop was to be her fourth show during the band’s two-year touring trek. After hearing about such dedication, I decided it wasn’t worth my time and effort to seek her out and flick her in the head. After all, this was only my second show of the tour, so I guess she deserved some kind of prize for her endurance alone. Besides, I was too hot and tired by then to even muster up the energy for a proper head flick. But alas, after waiting nine hours, it was finally time for the show to begin. Florence + the Machine opened with an exhilarating and impressive set. The unyielding sun’s heat remained constant throughout the opening act’s free-spirited and captivating 45-minute set, which almost made us forget about the sun as it sluggishly surrendered and fell from the sky shortly after 8:30. Just as the last cruel rays of sunlight faded, the stadium was filled with the sound of David Bowie’s classic “Space Oddity”, as the claw’s giant wrap-around screen showed the band members slowly making their way to the 150-foot stage, which resembled a giant, multi-lighted spaceship suspended in mid-air upon four legs. Larry Mullen, Jr. took the stage and began pounding out the opening drum beats of “Even Better Than the Real Thing”, as he was soon joined by the rest of his fellow band mates. Suddenly, our energy level was renewed as Bono and The Edge stood right before our very eyes. I had finally realized a life-long dream as I stood front and center as the members of my all-time favorite band (or as I refer to them, MY Beatles) made eye contact with two of their biggest fans. My heart seemed to beat perfectly in time with every song as U2 performed an impressive two-hour-plus set that contained their biggest hits and a few surprises. During the night, Bono showed no signs of ailment from his spinal surgery that had postponed last summer’s final shows. The set list had noticeably changed since I saw U2 on the second leg of the 360° Tour in the fall of 2009. Only three songs remained from their most recent album, No Line On the Horizon, as opposed to the six tracks that had been included during the previous legs of the tour. The revamped set contained such rarities as: “Zooropa”, “Discotheque” and the band’s first live performance of Zooropa’s “The Wanderer”, which contained Bono doing his own impression of Johnny Cash (Cash contributed lead vocals on the original 1993 album version). The concert, which questionably seemed to exceed the venue’s official capacity, gave new meaning to the term360 degrees as the 45,000-plus screaming fans in attendance could see the circular stage from every angle. Non-stop imagery and colors saturated the circular video screen throughout the show’s duration. Mullen’s drum kit revolved during various segments of the show and the band members took turns roaming around the inner and outer circles of the stage, which required us to do a complete 360 numerous times throughout the night’s electrifying performance. The concert ended with Bono pulling a blind audience member up on stage; he proceeded to play guitar as the band accompanied him on Rattle and Hum’s “All I Want Is You”. Try as I might, mere words cannot accurately describe what it was like to see the world’s largest traveling stage in person and with my own eyes. U2’s Middle Tennessee appearance marked the band’s 100th show of their tour, which turned out to be the ultimate U2 experience, with equal parts luck, timing, and tenacity required to make it all possible. U2’s 360° Tour deservedly holds the record as the most attended and highest grossing tour in history. Having sold over 7,000,000 tickets and grossing an astronomical $736,137,344, nearly every one of the tour’s 110 shows sold out in just minutes after tickets went on sale. Whatever cosmic alignment responsible for U2 adding a stop in Music City to the final leg of their 360° Tour may never be known, but all of us lucky enough to score a ticket to this extraordinary event will surely remember it as one of the most remarkable concerts of all time. After enduring the heat, the pain of aching feet and suffering from dehydration over the course of 14 hours, it was more than worth it. Should the same opportunity present itself in the future, I would gladly bear the physical punishment again and without hesitation. If I had to sum up my feelings in just one word, I’d describe the experience with the title of one of my favorite U2 songs, “Magnificent”.